When a kitten was in danger of losing his eye, a dog came to the rescue. Well, the dog’s blood, at any rate. Cloudy was doing what all kittens do, playing. And as often happens during any kind of rough and tumble, a scratch or two can occur. In this case, it was a scratch to the eye which ordinarily would only require some ointment and tie to clear up. This, however, became a more serious matter. 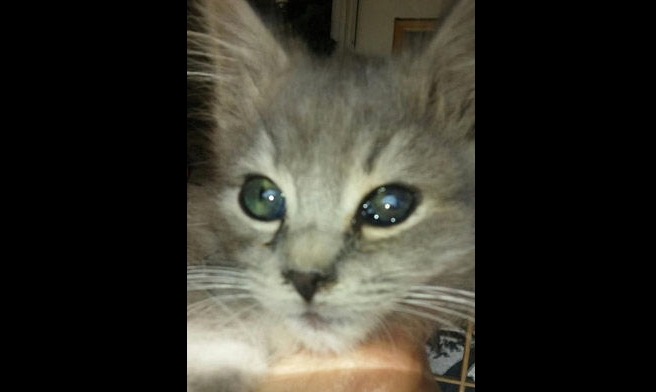 “A scratch poked a small hole in a kitten’s eye,” retired registered nurse and North Georgia Animal Alliance (NGAA) medical coordinator Nancy Frye told Northwest Georgia News, “and the iris, the colored part of the eye, started pushing out through the hole.” The kitten, a rescue with the NGAA, was in poor shape. His vision became impaired as the iris spread out over the pupil and keeping it from closing. Dr. Bergstrom of Veterinary Ophthalmology Services came back with a suggestion that sounded a bit odd. Applying dog’s blood to the affected eye. According to Frye, this is not as novel as it sounds, but it just isn’t used much. Given the alternative, removing the kitten’s eye, this was a welcomed solution. A volunteer from NGAA brought his dog to the offices to make the blood donation so the serum could be made. The serum, in addition to an antibiotic and saline preparation, was given to the foster mother who was instructed to apply serum to the eye three to four times a day for thirty days. “If she had not been so diligent, the outcome would not have been so good,” Frye said of Cloudy’s foster mother. The dedicated care resulted in the growing of a membrane over the protrusion that effectively tamped it down. Even more impressive, Cloudy can now see. Seems there was some bonding over the process, too, between foster mother and kitten. She decided to adopt the sweet little boy.